We wanted to get up to Stratford and knew we had a long day ahead of us. The locks came thick and fast until we got to Pilgrim Lock where we stopped for lunch. It was then on again until we arrived in Stratford. 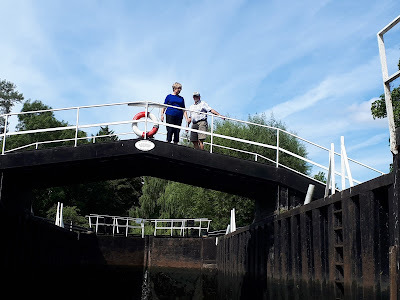 We shared a few of the locks with a boat called Jubilee – the boat seemed to ring a bell so I Googled it and realised that it was fellow blogger Halfie. 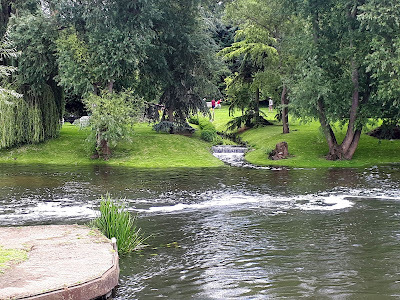 They went on beyond the bridge in Stratford and there are some interesting photos on his blog. We really liked Welford Lock and these few photos are taken there. 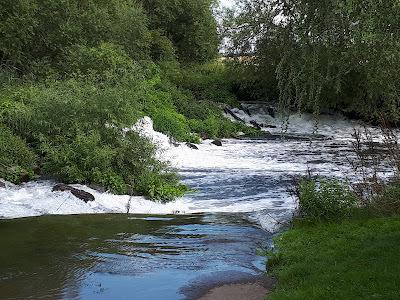 There is also a lovely weir but I couldn’t get near it – I could only hear it. 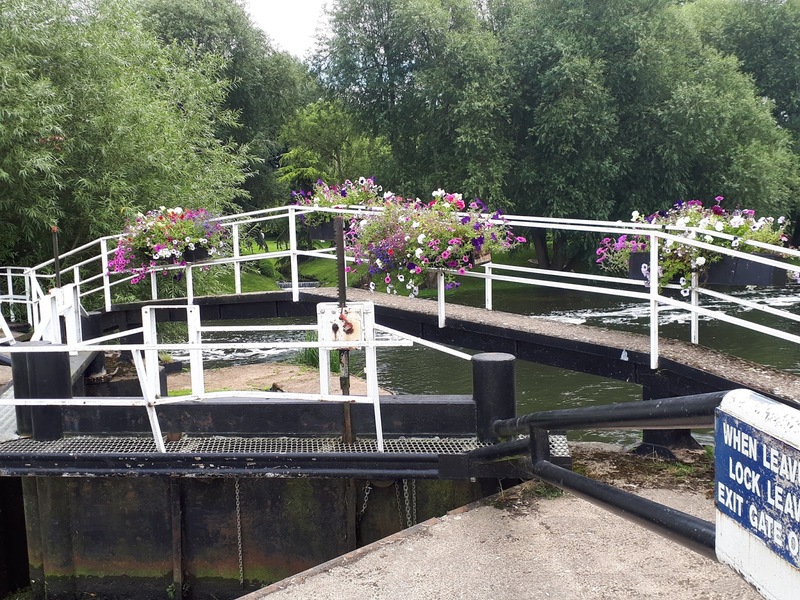 Welford Lock is also known as W. A. Cadbury Lock as the Cadbury family paid for its restoration. The remains of Upper Welford Lock are buried in the lock island. The next lock is Luddington where the weir is a bit like a rockery. As far as I can see the present Luddington Lock is new. The original was probably built around 1664. Adjacent was a weir, of which no trace remains. The lock was circular with a diameter of 75 foot and a lift of 3 foot. It had double head and tail gates with paddles inset. The sides of the chamber were drystone walled. 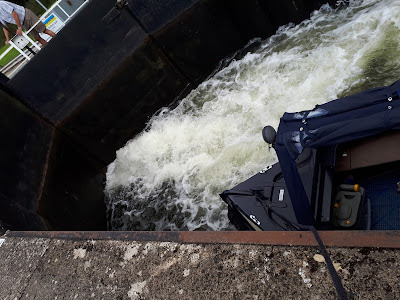 The bottom of the lock was unsealed except near the gates. The greater part of the stonework on the right hand side of the lock is intact, and the angular quoin provided to locate the right hand tail gate can be seen. The stonework on the left hand side has mostly disappeared, as have the gates. We moored up on the riverside in Stratford at about 4pm – very late for us. It was quite busy so we moved down towards the lock where there was less footfall as we wanted to have a barbecue. The freezer had been rammed with barbecue food which we hadn’t eaten so this seemed an opportune moment. It was such a nice evening that we were even able to eat outside. What am I talking about! Its August and we should be able to eat outside in the evenings!